Honestly, I don’t remember if I’ve ever seen Willy Wonka & The Chocolate Factory. I know I’ve seen parts of it as an adult – and found it pretty damn creepy, for the record – but if I ever saw it as a kid, it’s either lost in the distant mists of memory or buried under some manner of juvenile trauma. The only reason I bring this up is to point out that I have/had no benchmark by which to compare Tim Burton’s 2005 adaptation of the Roal Dahl classic (which I do remember reading dozens of times as a wee bairn). I’m a fan of Tim Burton as a director as far as his ability to bring fantastical ideas to the big screen goes, but am somewhat less enthusiastic about his storytelling abilities go. I find that he can often get so caught up in making his films look spectacular that the narrative component doesn’t get the attention it deserves, leaving the final product somehwat less than it could have been. So after seeing Charlie & The Chocolate Factory, I think maybe Burton has found the (golden) ticket – adapting well-loved works with so rigid a story that he can’t really stray from it, but leaves him plenty of room to interpret visually. Essentially, coulouring within the lines but using whatever whacked-out crayons he wants to. Not surprisingly, Charlie looks magnificent. 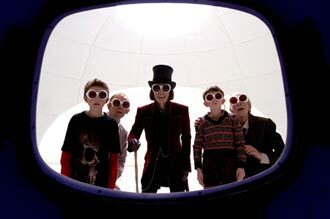 Dahl’s Wonka-fied world is tailor-made for someone like Burton to bring to the screen, and he does it with great aplomb. Everything from the Chocolate Factory and the Oompa Loompas to the creepy contest winner kids have the right balance of whimsy and weird, either delightful or disturbing depending on how you look at them. The make-up, in particular, does a fine job of giving the characters a disturbing pallor. Deep Roy deserves some sort of award for his performance as an infinite number of Oompa Loompas with their various “hits of the 70s”-inspired song and dance numbers. After seeing the trailers, I’d had some concerns about Johnny Depp’s performance as Willy Wonka – I had no doubt about his suitability for the part, I just wasn’t sure if I agreed with HOW he was going to portray the eccentric chocolateer. Thankfully, the mildly autistic man-child portrayed in the previews wasn’t accurate. While there is a bit of Rain Man present (as well as Michael Jackson), Depp plays Wonka more as the mischevious eccentric that one would hope for. My one complaint about the film, and I don’t doubt that it’s a common one, is Burton’s decision to stray from canon to add in a subplot about Wonka’s relationship with his estranged father, Count Dooku. It’s wholly unnecessary – in worlds as inherently bent as Dahl’s, there’s no need to ask “how’d this guy get this way”? No one cares, it simply is. The sequences add nothing but superfluous treacle-content and end things on a weaker note than it should have. But despite this, it doesn’t negate the fun and whimsy of the rest of the film which I enjoyed considerably more than I’d really expected. But for some reason, I have no appetite for chocolate. Lou Barlow just can’t stay away. He’s back in town for a show at the Horseshoe on October 2. Here’s a blast from the past – whilst housecleaning, Five Seventeen unearthed some soundboard recordings of a Sufjan Stevens show in Toronto waaaay back in December of 2001. He’s graciously mp3-ified the batch and put them online – head on over and start devouring my bandwidth like so many ravenous guppies. The Star-Tribune lays odds against further 80s/90s rock band reunions. 55% for The Smiths seems pretty damn generous, if you ask me. But even if it does happen, The Boston Globe will be having none of it. Elvis Costello talks to The New Haven Advocate about touring The Delivery Man and working with Emmylou Harris. This link (and the last ones) courtesy of Largehearted Boy. We saw C&TCF on the opening weekend to a packed matinee audience. The end of the film was greeted with a sizable round of applause. It’s been a while since I’ve heard that after a film. The squirrels were awesome. I just saw the Tim Burton version today, and while I’m a Burton fan, (less and less after Mars Attacks and Planet of the Apes), he ripped off so much from the original and added very little. I will say that the Oompa Loompa scenes in this new version were great, Deep Roy is fantastic and these scenes were tailor-made for Danny Elfman…it was like Oingo Boingo all over again. But you cannot surpass Gene Wilder in the role of Willy Wonka, ever. His performance was the opitome of black humour. Johnny Depp was entertaining and dark, but for the sake of dark. He clearly hated kids, which was amusing in of itself, but backfired when the happy-ending payoff didn’t really work. In the original it’s a bit sappy, but you feel that Willy is actually thrilled that he found the right kid, and it’s not just a blank smile from a Scissorhands-with-dentures. Also, I love the feel of the original which was set in some kind of nowhere/everywhere european-ish place (it was actually Münich). Anyway, that’s my vote…one for the old movie. It made me want to cry (and then read the book and remind myself just how good it was). Don’t ever watch the Gene Wilder version on mushrooms. The tunnel scene will haunt you.